Scientists have never seen anything quite like this before. It's a newly discovered species of fanged frog that gives direct birth to live tadpoles instead of laying eggs. It isn't that rare for scientists to find new species of animals, but finding an entirely new mode of reproduction is a different story altogether. The newly described species, called Limnonectes larvaepartus, was first discovered a few decades ago in the rain forests of Indonesia's Sulawesie island by researcher Djoko Iskandar. Scientists initially suspected that these fanged frogs give birth to tadpoles, but no one had ever actually seen it with their own eyes. All that changed this past summer when Berkeley herpetologist Jim McGuire grabbed a female frog who was oozing dozens of slippery, newborn tadpoles. There are about 6,000 species of frogs around the world, and the vast, vast majority of them engage in external fertilization, where the male grabs the female in amplexus and releases sperm as the eggs are released by the female. But scientists are aware of some exceptions to this rule; there are about a dozen species who are capable of internal fertilization — frogs who lay fertilized eggs or give birth to froglets. But L. larvaepartus is different from all the rest in that it's the only known species of frog to give direct, live birth to tadpoles. While still inside the mother, the tadpoles are nourished with yolk and develop without nutrient transfer. After birth, they have well-developed tails, pigmentation, and mouthparts. Strangely, the scientists aren't entirely sure how the males fertilize the eggs inside the females as "they have no obvious intromittent organ present to facilitate sperm transfer." The new species of fanged frog (they're called that because they have two fang-like projections that extrude from the lower jaw) prefer to give birth to tadpoles in small pools or seeps located away from streams. The researchers also suspect that the males guard the tadpoles. 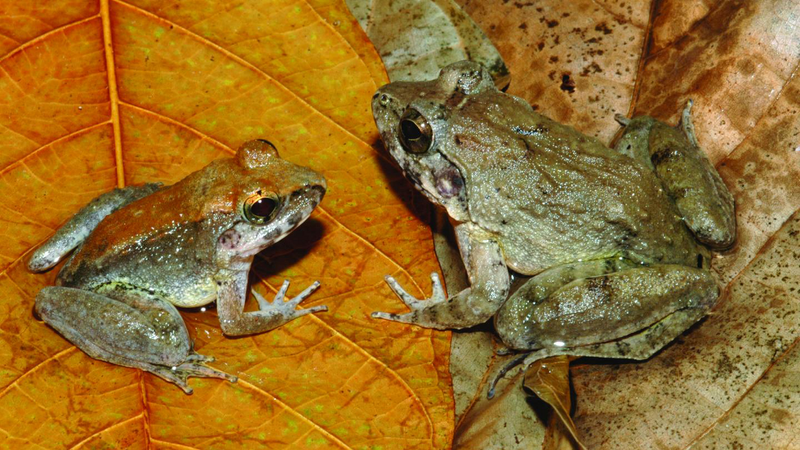 "[It] is clear that much remains to be learned about this unusual frog, the discovery of which brings to light yet another axis of diversity characterizing the remarkable Sulawesi fanged frog adaptive radiation," conclude the researchers in their study. Read the entire study at PLoS One: "A Novel Reproductive Mode in Frogs: A New Species of Fanged Frog with Internal Fertilization and Birth of Tadpoles".